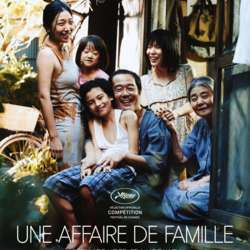 Lets watch this Japanese movie directed by Hirokazu Koreeda, that shows thé Life of a family who relies on shoplifting to cope with a life of poverty. One especially cold night, they see Yuri, a neighborhood girl they regularly observe locked out on an apartment balcony. They bring her to their home, intending to only have her stay for dinner, but choose not to return her after finding symptoms of abuse. The film premiered on 13 May Protected content the Cannes Film Festival, where it went on to win the Palme d'Or. Since then thé movie won professional prizes as well as really good critics for its beautiful sense of humanity. The movie starts at 2pm. Lets meet there at 1.50 with your tickets. We can go for a cup of tea afterwards for those who wish.